The CMS on Thursday proposed paying doctors for virtual visits and overhauling Medicare billing standards it has had in place since the 1990s. In a lengthy proposed rule, the agency said it would pay doctors for their time when they reach out to beneficiaries via telephone or other telecommunications devices to decide whether an office visit or other service is needed. 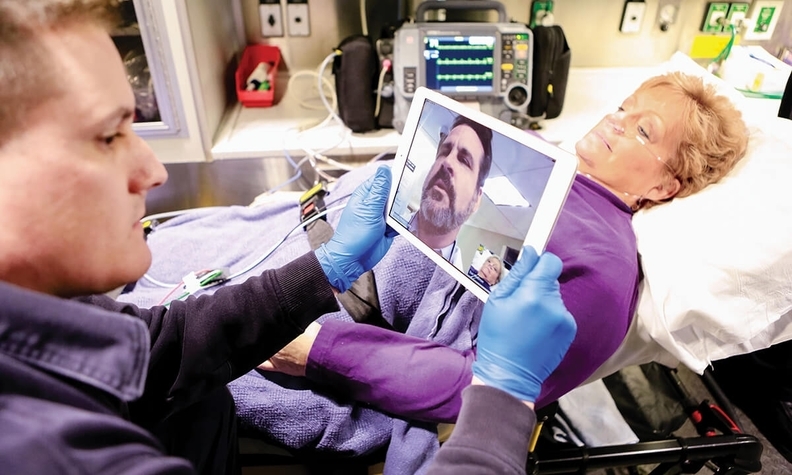 In addition, the CMS also proposed paying for the time it takes physicians to review a video or image sent by a patient seeking care or diagnosis for an ailment. "This is a big issue for the elderly and disabled population for which transportation can be a barrier to care," CMS Administrator Seema Verma said. "We're not intending to replace office visits but rather to augment them and create new access points for patients." Most physicians bill Medicare for patient visits under a relatively generic set of codes that distinguish level of complexity and site of care, known as evaluation and management visit codes. The CMS proposed allowing practitioners to designate the level of a patient's care needs using their medical decisionmaking or time they spent with the patient instead of applying the decades-old E/M documentation guidelines. In addition, the agency wants to eliminate the requirement to justify the medical necessity of a home visit in lieu of an office visit and is considering eliminating a policy that prevents payment for same-day visits with multiple practitioners in the same specialty within a group practice. "Today's proposals deliver on the pledge to put patients over paperwork by enabling doctors to spend more time with their patients," Verma said in a statement. "Physicians tell us they continue to struggle with excessive regulatory requirements and unnecessary paperwork that steal time from patient care. This administration has listened and is taking action." Elsewhere in the rule, the agency plans to continue a controversial site-neutral policy launched in 2018. For the second year in the row, off-campus facilities built after Nov. 2, 2015, will be paid 40% of the outpatient rates for the services they provide. The policy "encourages fairer competition between hospitals and physician practices by promoting greater payment alignment between outpatient care settings," the CMS said. The proposed rule includes some significant changes to administration of MACRA including letting physicians decide whether they want to opt in if they have a low volume of Medicare Part B enrollees or reimbursements and offering a waiver for clinicians who participate in a new Medicare Advantage demonstration. In the wake of the Bipartisan Budget Act of 2018, the CMS is slowing implementation of the Merit-based Incentive Payment System and proposed slashing 34 quality measures that it deemed ineffective after hearing from stakeholders. The proposed rule adds 10 quality measures including four based on patients' reporting of their outcomes. These are in line with HHS Secretary Alex Azar's promise to keep rolling back paperwork and reporting requirements. Physicians can opt in to MIPS if they meet or exceed one or two of the following new volume-threshold criteria: incurring $90,000 or less in allowed charges under Medicare Part B; treating 200 or fewer Part B enrollees who are paid for through the Medicare physician fee schedule; or offering 200 or fewer covered services. The CMS also moved forward with plans to have Medicare Advantage plans qualify as an alternative payment model through a demonstration program called the Medicare Advantage Qualifying Payment Arrangement Incentive. The demonstration would waive MIPS reporting requirements for clinicians who work within Medicare Advantage networks resembling advanced alternative payment models. In the proposed rule, CMS officials focused on the exchange of digital health information, responding in part to the 21st Century Cures Act, which called for greater interoperability and an end to information-blocking. The agency said there were still "significant obstacles" affecting that work, and it will push the matter with the 2019 requirements for certified electronic health record technology. MIPS-eligible clinicians will be required to use 2015 edition certified EHRs beginning next year, moving away from the 2014 edition products that some still use. The CMS asserted that the move will save providers money. But some clinicians begged to differ. "Today's rule proposes to require physicians to deploy costly EHR upgrades for 2019 and takes further steps toward implementing burdensome appropriate use criteria," said Anders Gilberg, Medical Group Management Association senior vice president for government affairs, in a statement. Regulators also outlined new scoring methods and performance categories, including the overhauled "promoting interoperability" category, with which they're pushing the digital exchange of health information between providers and also between providers and patients. In general, regulators want to make the requirements of the MIPS promoting-interoperability category similar to those of the promoting-interoperability program for hospitals. MIPS-eligible clinicians will have to report on all measures for all objectives to receive scores in that category, according to the proposed rule. Those measures are slated to change, the rule noted. The CMS wants to remove certain measures—including the patient-generated health data measure—that have been unduly "burdensome" for clinicians. It also wants to add measures, including one that would require clinicians to be able to query prescription-drug monitoring programs, in support of HHS' work on the opioid epidemic. Susannah Luthi and Rachel Z. Arndt contributed to this report.